Vegetarian Cookster: Pancakes, kale and soup.... oh my! Pancakes, kale and soup.... oh my! This entry is a bit of a round-up of what I've been eating this week... last Friday turned out to be a "snow day" me. Because I work in higher education, our campus sometimes closes when the weather gets too rough. Let me tell you, it's a great feeling to receive a phone call from your boss early in the morning, telling you to go back to bed because campus will be closed. :) In celebration, I treated myself to a pancake breakfast! 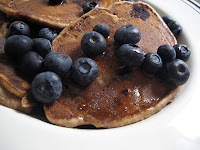 I chose this recipe for low-fat whole wheat pancakes over at Vegweb.com. I took their suggestion of adding fresh blueberries into the mix, and I couldn't resist adding a few more after the maple syrup had been poured. Deeeeelish! 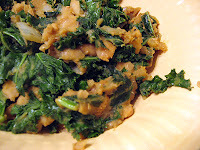 This week, I also tried this recipe for Bean and Kale Scramble over at fatfreevegan.com. It was my first time--ever--having kale.... and I liked it! 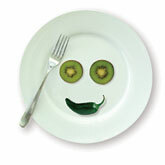 Maybe it just tasted so yummy because I knew this dish was low-fat AND packed with nutrients. :) I should also mention that this recipe used white beans that I made in the crockpot, which makes cooking dry beans easy! After soaking them overnight, I put the beans in the slow cooker with an onion, quartered, and some minced garlic with water to cover. Mmmmmm. I'm cooking ALL my beans in the crockpot from now on. I made a two-pound bag of dry beans, and once cooked, froze most of them in one-cup servings in the freezer. Now they'll be ready to use in future recipes. :) Many thanks to my mom for giving me the book Fresh from the Vegetarian Slow Cooker, which has the recipe for cooking dry beans in the crockpot. 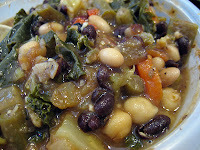 Another new recipe I tried this week was Susan's Dirty Little Secret Soup from her blog, Fatfree Vegan Kitchen. LOVE IT! I've had a difficult time getting into frozen veggies. My personal fav is fresh. But, frozen veggies are perfect for this soup, which is super duper easy to make. Love it, love it. I've been bringing it to work for lunch all this week... yummy. Can't wait to make more. Happy Birthday Jenny! It sounds like you are in for a treat! I have never, ever had a snow day, it would be so fabulous getting that call, sigh! I rather fancy making that soup too, I have already taken a note of it! Yay, I'm so glad you're back and blogging again :o). The Dirty Little Secret soup looks really yummy; dunno how I never saw it before on Susan's site! Good luck making your birthday dessert!!! Happy birthday! We've had our share of snow days lately too, enjoy them while you can! More like 5 words--Happy B'day!